So I've gone out and bought The 4-Hour Body book, not because I believe I'll be able to become an Adonis with a quick fix, but because I like to read up on interesting and different methods of achieving certain goals in the world of fitness and exercise. I've not finished reading the book, but so far I'm quite impressed with the little bits I have read. Some of it I will have to take with a pinch of salt, but after today's little experiment, I'll certainly be trying out a few of the ideas in this book. As has become habit as part of my current training programme, I swim on Tuesdays - I'm paying for a gym membership with a pool, so I'm going to blooming well use it. Prior to today, my sessions comprised of 80 lengths of 25 meters broken up into sets of 10 lengths alternating crawl and breaststroke. The alternation was required because my crawl has never been my strong point and I was finding completing 10 lengths pretty tiring and hard. I'm well trained in breaststroke as it was my primary stroke when I competed at school so it's a breeze in comparison. 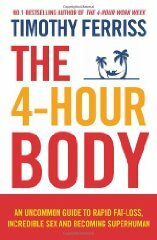 One of the chapters in The 4-Hour Body is "How I Learnt to Swim Effortlessly in 10 Days". It's not a very long chapter - in fact Tim Ferris, the author actually published the entire chapter on his blog years ago - but it provides enough information to get you heading in the right direction: that of learning how to swim crawl using the Total Immersion method. In a word: Wow!!! I was amazed at how graceful this guy was swimming with such little effort and at quite a pace too. By comparison, I must look like a flailing idiot who's only just keeping himself from drowning. Anyway, after re-reading the chapter and watching all the videos I could find on the topic, I hit the pool this morning for my first session of Total Immersion crawl. Well, to say I'm impressed is an understatement. I'm amazed. Gob-smacked and downright impressed. I took my time to make sure I performed everything as I had seen in the various videos and in the book and soon got into the swing of things. Before I knew it, I was on my 20th lap, still doing crawl, and I didn't want to stop. What was a relatively little change has made a dramatic improvement and I easily completed 100 lengths (2.5km) in 49 minutes WITHOUT having to stop (except to get water out of my goggles and to hit the button on my watch) and without having to do any breaststroke. As you can see, that's well over 30 seconds improvement per 250m in 2 weeks and I'm pretty sure that improvement has nothing to do with improved fitness. I think this is all down to an improved stroke. I had actually only intended on doing 2km, but as I got there so quickly and easily, I threw in 20 more lengths and I think I could have carried on for a fair bit more had I the time. My stroke is nowhere near as smooth as in the video, and I kick a bit more than he does, but it's certainly much better than it was. I'm very impressed with this and am looking forward to next week's swim already. All I need to do now is try and hone things a bit, improve my pace and learn an efficient tumble turn and I'll be zooming up and down the pool like a demon. I'm still deciding on what I'll do next from this book, but I'll certainly keep you posted on what I do do and how it goes.